Living up to the name ‘Rose of the North,’ Chiang Mai organizes the Chiang Mai Flower Festival to showcase its beautiful flowers and decorative plants which are in full bloom towards the end of the winter season in early February. Suan Buak Hat Park is transformed into an open-air exhibition center where you can find a magnificent tapestry of floral splendor that blankets the land, agricultural exhibitions, and floral displays, contests, and sales. Orchid lovers should not miss the opportunity to see a variety of beautiful orchids grown by locals. 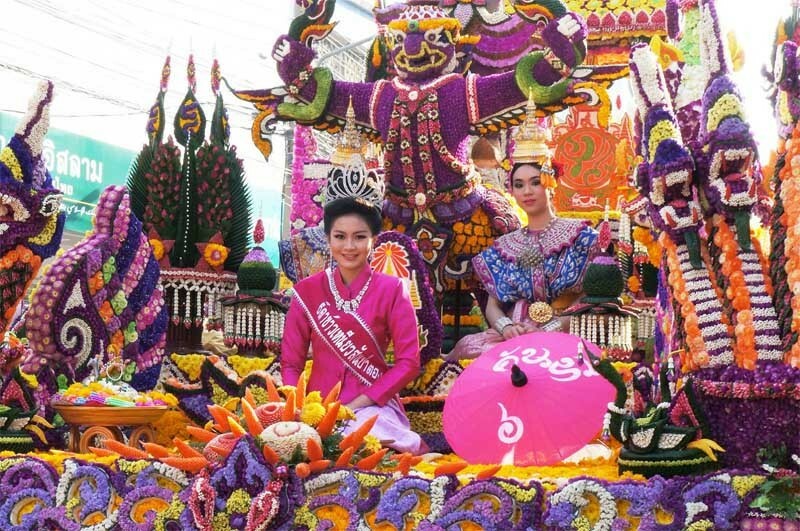 The festival also features flower-decorated floats that parade around the city showing the vibrant colored flowers as well as dancers in traditional costumes. After finish the elephant care program from the elephant retirement park, we offer to drop you of at the flower festival for visiting the amazing flower festival. Normally you will find a tapestry of floral and agricultural beauty, a true explosion of color combinations that features both traditional and experimental arrangements and decors. February is the end of the cool season and a blooming period for many of the local breeds, including many locally grown kinds of orchids. So, it’s not just at the festival grounds that you will experience the festival; many residents and shopkeepers in the city join in by putting flower displays in front of their houses and stores. During the festival, judges visit all the displays and ultimately pick winners in all the different categories. Meanwhile, the street next to the park is closed off and vendors sell flower, plants, seeds and flower bulbs. Just text us know that you want to visit flower festival on the remark box when you booking.